A city in the Shephelah, or plain of Judah; about midway between Jerusalem and the Philistine boundary, in a southwestern direction; probably not far from Socoh or Shochoh (I Sam. xvii. 1)—now Shuweikah—with which it is coupled (Josh. xv. 35). Its exact site has not been ascertained. Eusebius relates that a village, Ezekah, was to be found between Eluethe-ropolis and Elia. 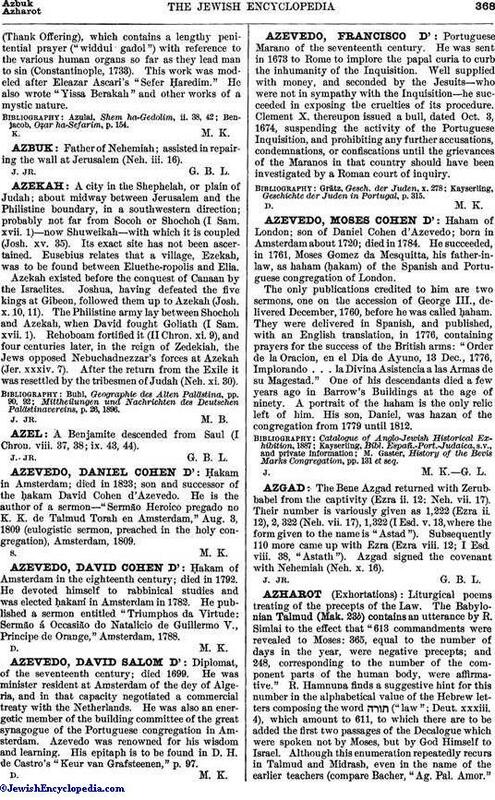 Azekah existed before the conquest of Canaan by the Israelites. Joshua, having defeated the five kings at Gibeon, followed them up to Azekah (Josh. x. 10, 11). The Philistine army lay between Shochoh and Azekah, when David fought Goliath (I Sam. xvii. 1). Rehoboam fortified it (II Chron. xi. 9), and four centuries later, in the reign of Zedekiah, the Jews opposed Nebuchadnezzar's forces at Azekah (Jer. xxxiv. 7). After the return from the Exile it was resettled by the tribesmen of Judah (Neh. xi. 30). Mittheilungen und Nachrichten des Deutschen Palästinavereins, p. 26, 1896.